…..news letter #513 – makeshift swahili…..
you know, even when it happens on a weekly basis, i’m still somewhat shocked and annoyed when ups decides once again to not deliver one of my shipments on time. oh well, less work for me today, twice the work tomorrow. anyway, if you haven’t noticed, christmas is creeping up quickly. if you are looking for something specific, be sure to come pick it up sooner than later as it will get harder in the next couple of weeks to get some stuff back in before christmas. – first release on sham palace, a new label from key sublime frequencies conspirator mark gergis. 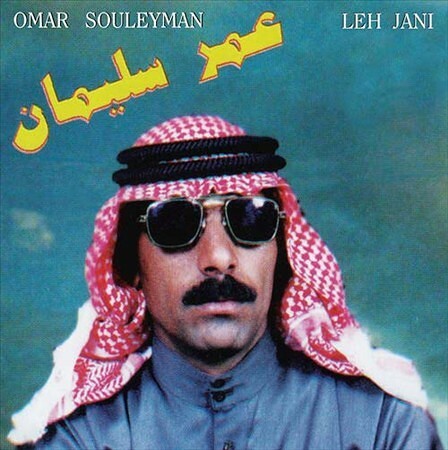 “leh jani” — the legendary omar souleyman track — was originally released in syria as a sprawling 30-minute epic groove, alongside two additional tracks. the entire 60-minute cassette album was recorded live to tape in 1998 at the home studio of producer zuhir maksi in the village of ras al ain in northeastern syria. many of omar’s early tapes were recorded in this fashion to replicate the feeling of his live wedding party performances while minimizing the inherent recording chaos and distractions of those parties. the full track — featured here, reveals plenty more twists and turns from synth and saz during its hypnotic course. “leh jani” appeared in slightly edited form on the original syrian-issued tape, which was distributed throughout the country for a short period of time. the song was further truncated for omar’s debut western compilation, highway to hassake and a concurrently assembled internet video clip of the track helped earn omar his first attention in the west. the album begins with a lively introduction followed by a majestic mawal, before showcasing the incredible uptempo and previously-unreleased “salamat galbi bidek.” all tracks are embellished with the virtuosic folk stylings of longtime collaborators rizan sa’id on keyboards and hamid souleyman on electric bozouk. this complete version of the original leh jani cassette album features an hour of music, and ensures an all-night syrian dabke party no matter where on earth you rest the needle. – a san francisco psych-funk band that formed in 1974 and played extensively throughout northern california. by 1976, the band recorded their first and only album at pacific recording studio in san mateo. the original title of the album was meant to be sativa, but out of fear that promoting the joys of marijuana would be too controversial, the band omitted the title and just left it as aura. over the ensuing decades, the aura album has grown in stature to become a major soul/funk collector’s item. high quality vinyl reissue, printed on old-school tip-on jacket. – the much anticipated, and oddly timed new album from this monstrous rock duo. you probably don’t need me to sell you on this one, do you? – germany, 1978. absolutely early ’70s-sounding progressive and psychedelic folk-rock masterpiece of the first order. entirely sung in english by an incredibly young female vocalist, beate krause, only 16 years-old! long tracks with excellent, killer acid guitar solos, and moog. if you like groups like mellow candle or pentangle, there’s no doubt you need to purchase this one fast. often praised as “the best prog-folk record ever,” this is an absolute classic of the genre. – “this release features three tracks recorded in various locations in the phoenix area in the mid 1980s. two of these tracks have never been released.” uh… awesome! – a “black friday” release… 12 unreleased live favorites and 45 b-sides from the reigning champions of soul. – ‘waiting for you’ returns now as ‘without you’, transformed by a raft of carefully chosen collaborators (including scritti politti’s green gartside, kuedo, flying lotus, gang gang dance, and kode9 & the spaceape). radical reinterpretations that follow somewhat in the tradition of reggae, in the same way that the original ‘waiting for you’ album did. – hailing from northern senegal, lewlewal de podor is a pulaar guitar centric band that draws from the folk stylings of fouta toro. featured on last year’s compilation ishilan n-tenere, their first ever full length ranges from mellow acoustic jam sessions to electrified hip shaking concerts. comes with booklet and portrait studio photo. old school “tip-on” cover. – “the fourth album from the welsh indie rock conglomerate. hello sadness’ 10 tracks cover what we are coming to recognize as core los campesinosconcerns – love, loss, heartbreak, football (always football). but this is a record that’s wiser and more focused than its predecessors, confident in its abilities and clear in its aims. los campesinos! at their most melodic, direct and exhilarating. – “bolstered by one of the most celebrated and startlingly unique record covers ever, 1959’s satan is real delves into a strange netherworld of country that no longer exists. touching on the louvin’s fire and brimstone southern baptist upbringing, the title track’s spoken recitation proclaims the existence of the devil himself. thought by many to be the pinnacle of the louvin brothers’ recording career. it’s certainly an album you’ll never forget. – “paul ngozi (nogozi means danger) with his band gave a popular voice to what later was called ‘zamrock,’ a cool fusion of older african rhythms and ’70s rockish underground modes — never too polished, but with a tightness that might have made anglo groups up in London sit up and take notice. the guitars are razor-sharp here which sounds great next to the harder rhythms at the bottom, and the album’s mix of english and zambian lyrics. you will love this one if you liked the witch and amanaz. – now available on vinyl! jet-packing around the indie / garage cosmos for the last four years, ty segall has done too many singles and eps and split records and shared records and albums and cassettes to count. goner brings you a double-album of tracks culled from segall’s massive out-of-print catalog—plus some stuff that never made it out in the first place. – super fancy reissues of these two classic 1990s albums. remastered and all that jazz. – two acclaimed albums from andy stott available for the first time on cd, including four bonus tracks. taking influence from an array of seemingly incoherent noises, these tracks create their own pace and agenda, largely shying away from the dancefloor in favor of something more complex and hard to define. – a much needed reissue of their massive second album from 2000, which was remixed by nurse with wound and recently released on vinyl as ‘the iron soul of nothing’. heavy. – back in stock!!! we managed to dig up a nice little stack of this essential reissue. most of these are already spoken for and gone, so don’t think about this, get it today!! – from 1958 to 1993, the industrious boddie recording company issued nearly 300 albums and 45s, recorded 10,000 hours of tape, and remained in operation longer than any other studio, pressing plant, or label group in the history of cleveland. long forgotten even by the standards of the chronically overlooked northeastern ohio music scene, boddie was a fusion of its owner’s engineering genius and his limited economic means; its diy recording studio housed in a humble barn, churned night and day to capture the sounds emanating from cleveland’s east side neighborhoods. the 58 tracks on these three cds (or 65 track 5lp) represent the best of the boddies’ in-house soul kitchen, luau, and bounty labels, which released an unspoiled treasure trove of kitchen-sink eccentric soul, fuzzbox funk, shoestring doo-wop, and haunted, eerily hook-laden spirituals. enclosed inside is a mountain of office-styled ephemera: two massive booklets brimming with detail on the boddies and their artists; extensive notes and scores of unpublished photos; a complete detailed discography folio; reproduced fliers; and a boddie greeting card—all rendered with the handcrafted charm that was the boddie hallmark. call it a self-contained record industry crammed into one box. – chicago’s richard pegue was one of the most intriguing figures to come out of the chicago soul scene in the 1960s and 1970s. raised during the city’s fertile doo-wop era, pegue immersed himself in music immediately. the nickel and penny labels featured in this compilation are twin sides of the same eccentric coin, pegue himself. he was the writer, arranger and producer of some of the most beautiful chicago soul records in the ’60s and ’70s; too bad they all went out of print weeks after being released.